First off, a big HELLO to all my new readers. Last week I was “freshly pressed” on WordPress, meaning the WordPress editors featured one of my blog posts on their main page. I received thousands of page views as a result of the posting, and my phone has been going off non-stop since Thursday with everyone’s amazing comments and notifications of new followers of the blog. So thanks for stopping by! I haven’t had a second to respond to comments but I’ve read them all and loved each one. I also seem to have a lot of views in India… so hello, India! 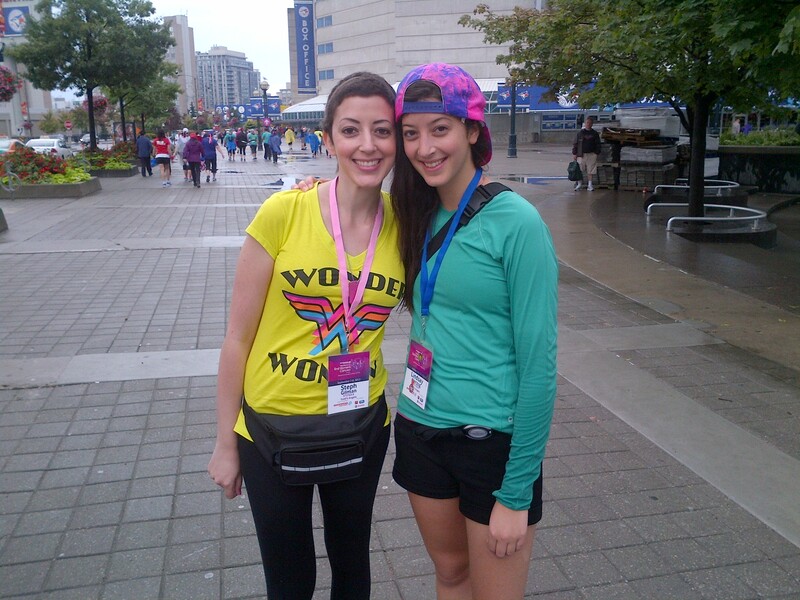 If you’ve been following along, you should know that this weekend my family and I walked in the Weekend To End Women’s Cancers, benefiting the Princess Margaret Cancer Centre. 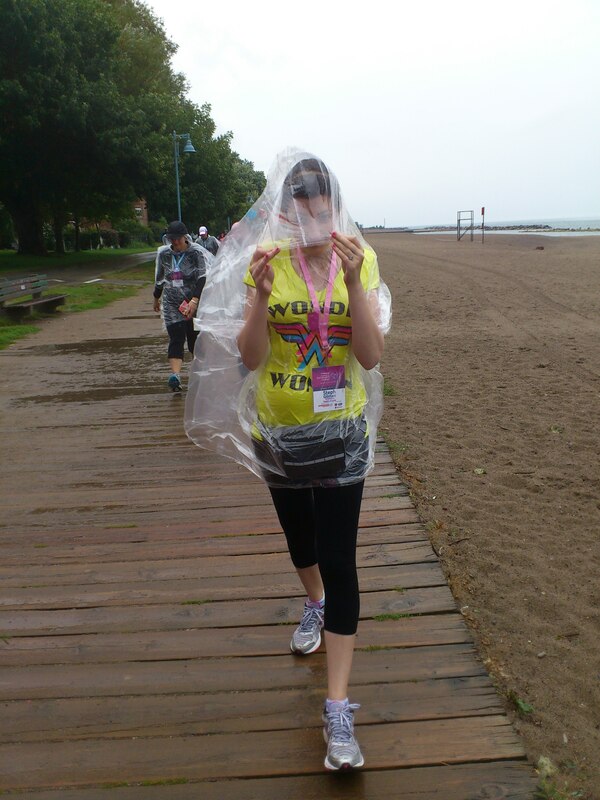 Yesterday was Day 1 of the walk and if you live in Toronto, you might recall that it poured rain the entire day. The. Entire. Day. My friends, walking in the rain with puddles in your shoes for 32KM is not fun. We were cold and wet. Very wet. But we powered through and somehow made it to the end. Because of my fatigue and various problems with my hips and knees, I thought I wouldn’t even make it half way, so I am fairly proud of myself that I managed to walk through a monsoon in my current condition. I also paused briefly during the lunch stop to do an interview with the Toronto Star. They published it today and if you don’t subscribe to The Star, you can see it here. Today was Day 2, and the weather was much more suited to long-distance walking. Unfortunately, my body was a bit damaged from the previous day. I can’t walk straight without searing pain in my knees and thighs, so I had to do a very unattractive limp/hobble for the rest of the route. The pain in my legs is actually very similar to the pain I felt when I was doing chemo, and reminds me that it was only several months ago that I couldn’t even walk down the street without being in pain. I have come a long way, you might say. Chillin with some Smart Food. I will never pass up an opportunity for free food, and this weekend, there were many. 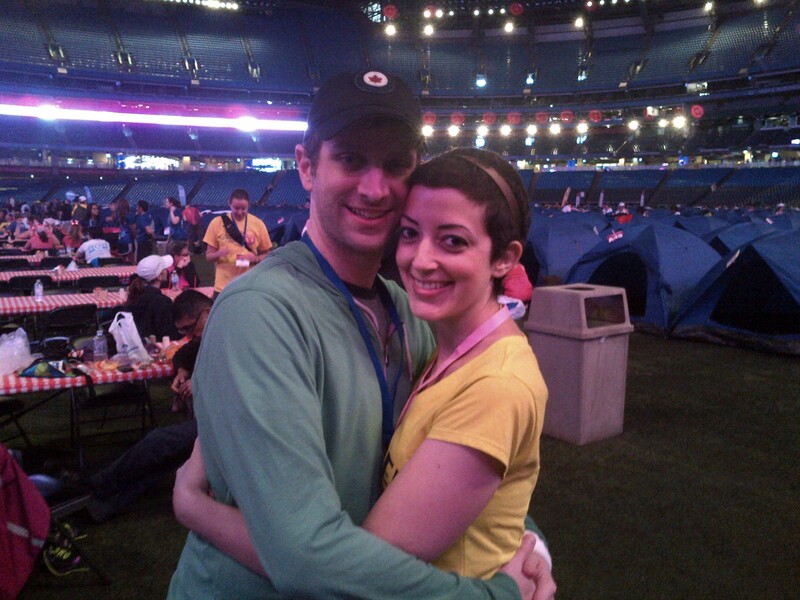 At the end of the walk, we marched down the finish line, into the Skydome (or the Rogers Centre, if you go by the new name… which, I don’t) and saw our faces up on the jumbotron. It is quite alarming to see your face that large, but since it isn’t something you experience every day, I loved it, and milked it for all it was worth – waving at the cameras, and doing some sort of awkward limp-jig down the aisle. 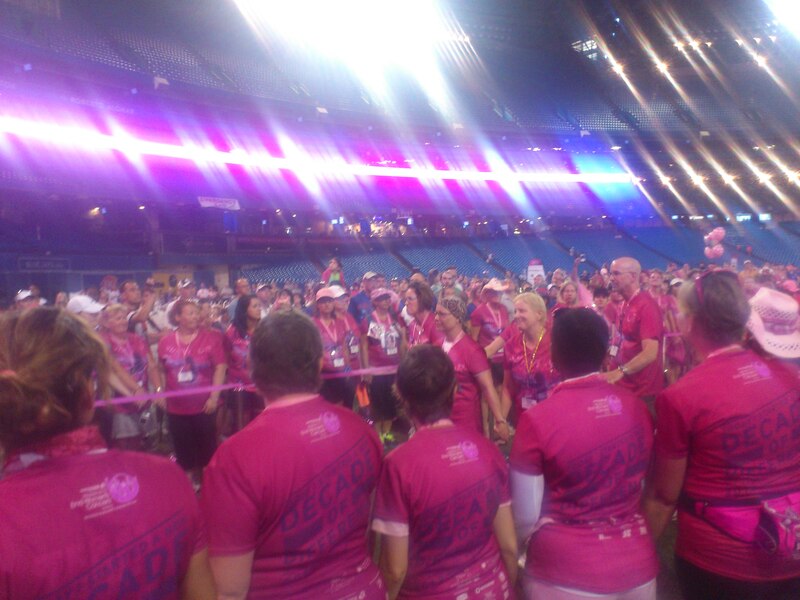 As the last walkers came marching in, it was time for my speech at the closing ceremonies. Right before it started, I had that feeling of why did I agree to do this, I just want to lie down and fall asleep and never get up. I was also getting paranoid about my nose dripping all down my face, since my drugs seem to have the nice effect of giving me a nasal perma-drip. Luckily, I believe my sniffles were mistaken for tears, so that worked out just fine. The speech went well, and it was quite a surreal experience, standing up on a stage, in the middle of the baseball field, speaking to a huge crowd of cancer survivors and their supporters – especially in contrast to last year, where I had been a mere onlooker, anxiously awaiting the results of my biopsy. I managed to keep myself composed until near the end, where I said the words “I am now a survivor.” I had practiced the speech a dozen times before, and never got choked up, and assumed I wouldn’t when I did it in front of others. But I guess it took saying it in that setting for it to really hit me. Those words. I am a cancer survivor. I could see the tears of everyone else looking back at me, and apparently crying is contagious, because I dissolved into a puddle at that moment. Everyone cheered for me and the spotlight was shining in my eyes and the entire thing felt like I was in some sort of dream, or playing a part in a movie. It was an amazing experience, and I’m glad I was able to do it, and hopefully did justice to the other women fighting it out with the big ugly C.
Afterward, I had many women coming up to me and hugging me with tears in their eyes, sharing their stories, and congratulating me on a job well done. Three young girls came over to me and they each hugged me, and told me I was their inspiration and hero, and because of me, they are going to do the walk next year. They had tears in their eyes and seemed genuinely moved. I turned to my sister, and we both, again, burst into tears, in reaction to the sweet sentiment of these girls. It was such a great compliment, to know I had affected them in some small way. I continue to be amazed by the power my words can have upon perfect strangers, and the power that theirs can have right back on me. Amidst all of the crap that I have endured, I feel so lucky for all of the people who have come into my life, however brief, as a result of me having had cancer. And now I am home, back on the good ol’ couch, full of aches and pains and unable to stand without feeling like my legs are breaking beneath me. But I don’t mind. Because it’s pain from walking. From raising thousands of dollars for cancer research. From using my body. Not pain from cancer. Not pain from cancer drugs. I could get used to this kind of pain. Bring it on. Well done!! An amazing achievement and it seems you’ve come so far! My nan was diagnosed with ovarian cancer before I was born and is a fellow survivor!! You’re an inspiration to all women. The tears represent how far you’ve come, the struggles you’ve faced and the will to fight for all the other women who are/have been and unfortunately will be in the same position. WE WILL FIND A CURE for ALL cancers! just read your entry about scanxiety which is a new term to me. i am one year out from surgery for uterine cancer. radiation was over the winter. i have lost track of how many scans I have had over the year plus since my diagnosis. had a full torso scan yesterday. what makes me crazy is the number of people who say “I’m sure it will be fine.” whaaaat? you are sure? do you have a direct line to God or the future. I am sure of nothing any more. prayers for us both darlin’. have a good sleep. i get my results monday. how about u? Not sure, they gave me no indication. There always seems to be pretty poor communication about getting test results… one of the many problems with the system I wish I could fix! hmmmmm….i go to pmcc and my appointments are always booked ages in advance…for the scans as well as the follow up. i usually get a volunteer driver as well and that saves a lot of $$ and aggro. be proactive and call them to find out…it will be less stressful than the chronic waiting i think. I am brand new to blogging and I just came across your blog when I checked out the “Freshly pressed” section. Documenting my cancer journey is also what drove me to create a blog (only two posts in: http://dontmentionthecwords.wordpress.com/). Reading some of your posts, I am torn between finding inspiration from your humour and fighting spirit and not wanting to know about some of the crap I might have to go through. Have just had my first chemo and dreading my hair falling out. But planning on rocking a mohawk – because when else would I get a mohawk? Congrats on your inspirational walk – keep it up! I know you’re a few months ahead of me in terms of treatment, and to see that your hair looks great! I look forward to when I don’t have to wear scarves or wigs anymore. Hi Randy, it was so nice meeting you as well! I just looked through my photos, and it appears it was about 10 weeks after my last chemo that I went out without anything covering my head. Here is the pic: http://instagram.com/p/aTvQl-gUcQ/ Still not much hair at that point, but a tiny bit and I was sooo sick of covering up at that point especially because it was so hot out. It is easier in colder weather, for sure. I felt like it took my hair a bit longer than average to start coming back though, so just be patient and believe that it will come back. I know it is hard! Amazing what a little hair and makeup can do! You looked great then and awesome now!! I felt good on the walk, I swept after lunch on both days, and glad I did, I was tired. I don’t really know where I got the energy from. Now just waiting for BRCA results to determine my next steps, and still have 15 Herceptins to go. I’m back at PMCC on Friday morning. Take care!! Hi Steph. I completed the Walk on Sunday as well. What an experience. 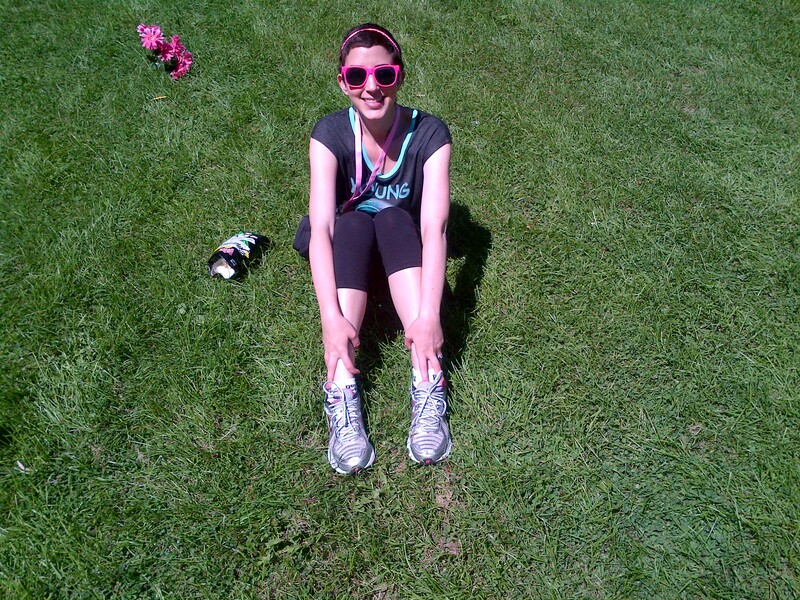 It was my first time, but not my last – I have already registered for 2014! My team raised over $8,000 and I am so proud of them. I was so touched, listening to you speak on Sunday. You are an incredible, young woman. I look forward to maybe even meeting you next year! So happy to read this! Yep, I am one of those new readers from your Freshly Pressed post, though I didn’t comment on that one since I know how overwhelming it can feel at the time. You should be sooooo proud of yourself! What an accomplishment! You are so lucky to have such an AMAZING family to support you! I hope you ate ten cupcakes after your walk, you certainly earned it! I’m beyond proud of you. I don’t even know how to put it in words. This is all so beautiful. I’m so joyful reading about it and seeing the pictures. Thank you so much for this. Big High Five to an amazingly beautiful survivor woman!